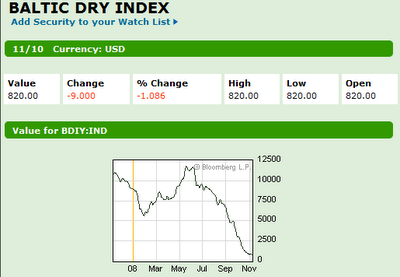 OK, the Baltic Dry Index (BDI) not nil but minus 9. The point is that on the day that China announces a stimulus package equal to 14% of its GDP (but over 2 years) the BDI falls 1%. Not exactly a ringing endorsement from the index which would be more accurately termed the Beijing Demand Index. While it's true that the magic of GUBAP* may be at work these are still Very Large Numbers not to react to. So, as has been found further west, announcing such sums is one thing. Deploying them optimally (not to mention with noticeable effect) quite another. Excellent run down from FT Alphaville here (and won't someone please tell them to put a direct link to Alphaville on the front page of the new FT site format).